This is one of the filmiest excuses by majority people. Well, it will work on you only when you approach it with a right attitude. 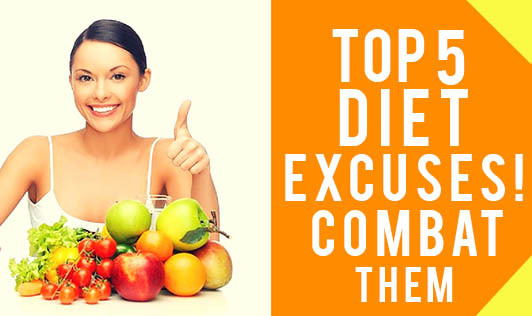 Kick out the fad diets and adopt sensible healthy eating habits and you will be astonished to know what dieting is? Stick to them and achieve your optimist goals. This is again the most familiar excuses anyone can hear telling it to the health experts due to their busy lifestyle commitments. But remember that where ever you are; go for a balanced diet with right portion of food that will keep a check on your weight. Nuts and fruits are easy to go foods that can keep you fuelled up throughout the day, however busy you are. Do you love food too much to give any of it up? Contrary to popular belief, dieting doesn't have to be boring. In fact, with a bit of sound knowledge and careful management about the food, you can still eat all of your favorites. Remember there's always abundance of healthy food out to choose from. I agree the genetic cells play a role in individual's weight factor. But it doesn't mean that a person who is overweight can become obese. In fact, research suggests that regular exercise outweighs the effects of fat genes. So, whether your family has ingrained unhealthy eating habits into you from a young age, or you feel you are genetically fat, you can still combat this with a healthy eating and exercise plan. Slow metabolism comes only when you go into starving state or when the right quantity is not consumed by you. Regular exercise and a healthy diet pattern at proper time interval will increase your metabolism that in turn lead to increased metabolic rate. So, be kind to yourself and treat yourself well and you may be surprised what you find on you! !